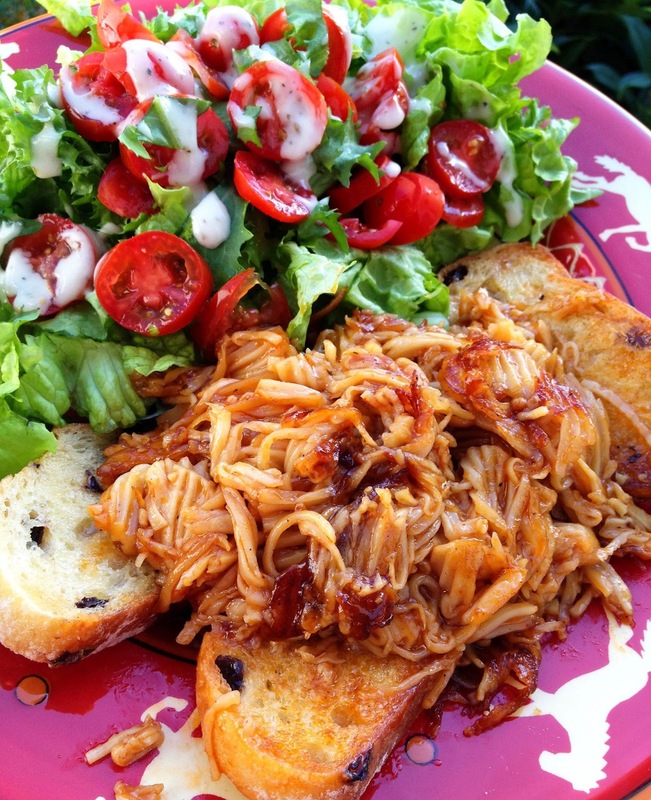 I realize BBQ-saucy, shredded "pulled-pork-style" jackfruit is the darling of the vegan recipe world right now (and believe me, I LOVE me some jackfruit!!) but I much prefer this style sandwich with shredded .....mushrooms. 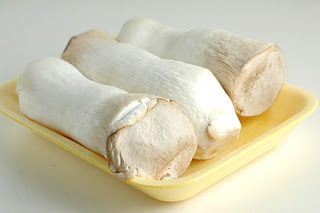 This really won't work so well with other mushrooms, you're going to need the firm, but easy-to-shred, texture of the giant King Oysters. If you've never worked with them, they're great big things - roughly the size and shape of a chicken drumstick, usually found in your local Asian Market or better-stocked grocery stores. Seriously? Prep takes a little while, (i.e., lots of wordy directions), but follow along, I promise, it's the EASIEST way to impress non-vegans ever! And did I mention, they're ridiculously CHEAP! When it's all cooked up, the texture is a little softer than chicken, but seriously, who's comparing things that closely? Even the DIE-HARD meat-lovers I know will happily gobble up an entire pan full of these! The umami caramelized-mushroom and BBQ flavor and hearty texture ends up looking and tasting deliciously shreddy-meaty-BBQ-y. Finely shred the mushrooms using the finest shred, matchstick or julienne blade on your Mandoline Slicer; You want toothpick-thin slices. If you have a food processor with a feed chute and shredder blade, you can use that too. Melt margarine in a large skillet, add shredded mushrooms, onions and salt; Saute on med-high (as high as you're comfortable with) until the mushroom and onion get bits or brown on them. Add a bit more margarine if needed so things don't burn. Reduce heat, and cook, COVERED over medium, stirring occasionally, until mushrooms release liquid and become juicy, about 10 - 15 minutes. Continue to simmer, covered, until vegetables are soft and tender, about another 10 minutes. (Add a couple Tbsp. water if it isn't still a bit "juicy"). Stir in BBQ sauce and water, remove cover and simmer another 10 minutes or as long as needed to evaporate sauce a bit. When sauce has thickened, turn heat to high and stir frequently/watch closely until extra moisture evaporates and mixture becomes thick and sticky. Allow to "stick" and caramelize a bit, but scrape pan to prevent mixture from actually burning. Serve over hot sourdough toast, burger buns (or try with a hearty, non-sweet, rustic raisin bread like I did.) Coleslaw is a nice touch here too!